VietPress USA (Oct. 1st, 2018): President Donald Trump urged the GOP controlled Senate to vote immediately to confirm his Supreme Court nominee Brett Kavanaugh and ignore any sexual assault or misconduct accusations. Professor Christine Blasey Ford has accused Kavanaugh had a sexual assaulted her during their high school 25 years ago. She proposes a FBI investigation before oath testimony. But after both Kavanaugh and his accuser Ford testified, the Catholic Magazine of USA revoked its endorsement for Kavanaugh. The following day, on Friday, the Senate Judiciary Committee voted with 11-10 to bring the case to Sanate floor for confirmation. But only Republic Senator Jeff Flake of Arizona requested to have FBI investigation before voting. For this GOP Senate proposed a maximum period for FBI investigation is one week. President Trump accused Democrats to play the "con game" to stop Kavanaugh from Supreme Court nomination. Today on Monday Oct. 1st, 2018, Sen. Jeff Flake official oppose President Trump's nominee should an ongoing federal investigation determine he lied under oath. Sen. Jeff Flake, R-Ariz., speaks on the Senate floor Oct. 24, 2017, at the Capitol in Washington. Flake announced he will not run for re-election in 2018. Monday marked Flake's second New Hampshire visit this year. The 55-year-old soft-spoken Republican, who is retiring from the Senate at the end of the year, is a reluctant presidential prospect at best. During a spring visit to the state, he declared his interest in a possible 2020 presidential bid — as a Republican or an independent — if no other Republican were to step up to challenge Trump. MANCHESTER, N.H. (AP) — The Republican senator who suddenly sits at the center of the explosive Supreme Court debate promised Monday to oppose President Donald Trump's nominee should an ongoing federal investigation determine he lied under oath. Arizona Sen. Jeff Flake, who holds extraordinary leverage in the confirmation process, addressed Judge Brett Kavanaugh's future directly as he trekked across New England while exploring a possible run for president. Asked what would cause him to vote "no" on Kavanaugh, Flake pointed to "any evidence that corroborates" his accuser's story. "Any nominee that lies to the committee, that is disqualifying," Flake told reporters after delivering a speech in New Hampshire, the state that hosts the nation's first presidential primary election. During a Boston appearance earlier in the day, Flake also vowed to ensure the FBI conducts "a real investigation" into the allegations against Kavanaugh. "It does us no good to have an investigation that just gives us more cover," he said at the Forbes Under 30 Summit. Flake's comments came as the White House insisted it's not "micromanaging" a one-week review of decades-old allegations of sexual misconduct against Kavanaugh. Some Democratic lawmakers claimed the White House was keeping investigators from interviewing certain witnesses. Monday marked Flake's second New Hampshire visit this year. The 55-year-old soft-spoken Republican, who is retiring from the Senate at the end of the year, is a reluctant presidential prospect at best. During a spring visit to the state, he declared his interest in a possible 2020 presidential bid — as a Republican or an independent — if no other Republican were to step up to challenge Trump. Three days ago, the Republican senator single-handedly delayed Kavanaugh's confirmation proceedings by insisting on an FBI investigation as a condition for his support. The GOP's razor-thin majority in the Senate, 51-49, lent power to his demand. At a rally that drew hundreds to Boston City Hall, New York congressional candidate Alexandra Ocasio-Cortez warned Flake and other elected leaders that voters would end their careers should they support Trump's Supreme Court nominee. "We are going to keep pushing because justice in America is not just about protecting the powerful," Ocasio-Cortez said. "It is about uplifting the voices that have been victimized." Boston Mayor Marty Walsh offered a direct message to the Republican senator from Arizona. "I guess I want to say, 'Thank you,'" Walsh said. "But that's your job. That's your job to vet the nominee." "In the climate we've got today it's going to be hard for someone like Jeff Flake to get any kind of momentum," he said. "I think it's a very conservative party right now." While Flake is a self-described "proud conservative and lifelong Republican," his impending retirement has freed him to condemn the political climate in Trump's GOP. Facing New Hampshire voters at Saint Anselm College, Flake repeatedly condemned the rise of "tribalism" shaping the Supreme Court debate and U.S. politics. "My message here today is tribalism is ruining us. It is tearing our country apart. 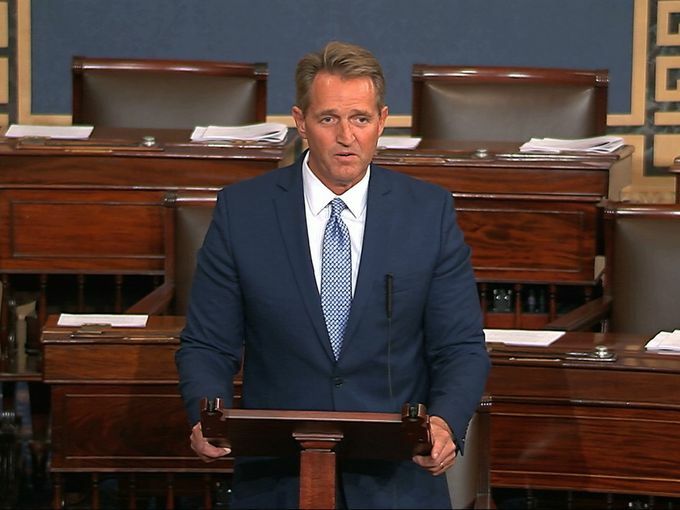 It is no way for sane adults to act," Flake declared. "I've been failing my tribe for some time now," he continued. "I hope to continue to fail my tribe."